There are more out there on Instructables, but here is one to look at and ponder. Where I previously was interested in the Copenhagen wheel, the FlyKly, is available now. FlyKly has been in the works for a while. Originally a Kickstarter project that raised $700,000 (its goal had been $100,000), the electric bike wheel project is now available to everyone. Electric bicycles are nothing new. But FlyKly’s approach is different — use your own bike, the company says, and just buy our wheel. That’s an attractive proposition if you’ve got a bike you love but want a little electrical propellant to get you where you’re going without building up a sweat. The FlyKly isn’t cheap. The hub alone — which contains the product’s motor, battery, electronics, sensors, and Bluetooth antenna — runs $1,000. If you want it on an actual wheel, it’s $1,100. And you can also buy a FlyKly-fitted bicycle from either MSC or Linus for $1,500. The wheel comes in a 20-inch, 26-inch, or 28-inch rim. 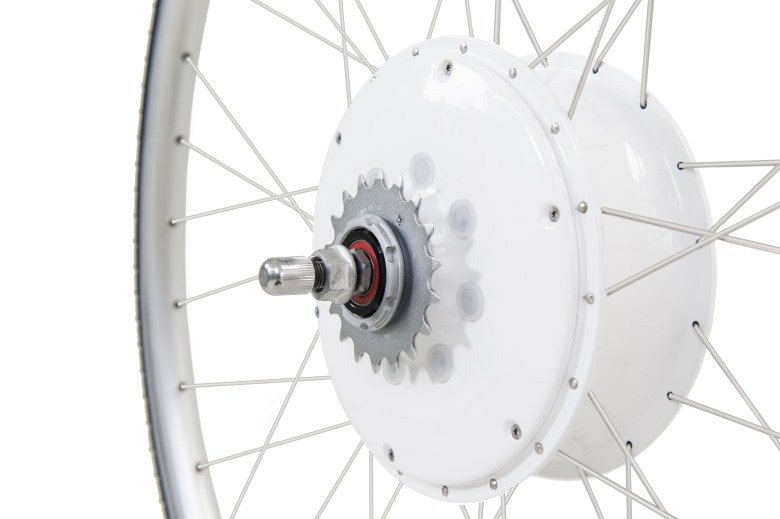 The company’s not the first to try the removable electric wheel, with a similar approach in the works with the Copenhagen Wheel. But FlyKly is first to market, Klansek said. Lest you wonder, the FlyKly system is not meant to provide every bit of forward motion as you ride. That’s called a motorcycle. Rather, this is “pedal-assist,” Klansek said. That means that once you start pedaling, the motor turns on and boosts your acceleration, but you still have to, you know, pedal. The obvious questions are about battery life and power boost. Klansek explained that a fully charged battery should deliver up to 60 miles on a single charge if you maximize the system’s settings (though the FlyKly app, naturally) and pedal backwards as you go, which both brakes and recharges the battery a bit. With no tinkering of the settings, and no backwards pedaling, you’d get about 30 miles, he said. For anyone who is just now stumbling upon this page, because the Kickstarter campaign is over, you will no longer be able to get the ebike kit I assembled here. However, that doesn’t mean you can’t still build yourself an awesome ebike! There are many other options for sourcing a great quality kit to match your needs. I want to highlight my favorites here so that you can see a few other options for building an ebike in the future. They might not have the same low price as my kits, but each is worth it and you can find some even more powerful kits than what I offer. Grin Technology (www.Ebikes.ca) – I might as well start with the best, and the best is Ebikes.ca thanks to their quality parts and their unmatched service. There is a consensus among the DIY ebike community that Ebikes.ca is essentially the high water mark of the industry, and the golden standard by which most other ebike suppliers are judged. Whether you need a small geared motor, a medium sized direct drive or a big powerful motor, they’ve got you covered. Ebikes.ca is also home of the Cycle Analyst, which is a great electric bicycle wattmeter and diagnostic tool that functions like an instrument panel for your ebike. Anyone looking for a quality North American parts supplier can find everything they need with Grin Technologies. 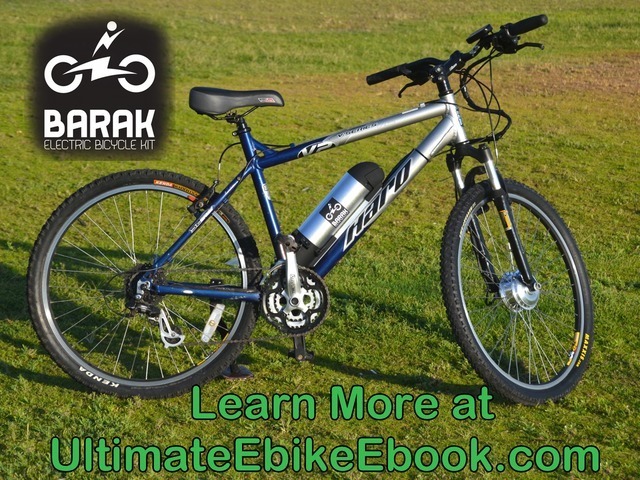 Electric Rider (www.ElectricRider.com) – Electric Rider is a great US company for someone who wants a powerful ebike. Between their geared and gearless kits, Electric Rider offers some of the most powerful ebike kits available for beginners and experienced ebike builders alike. Their service is also great, they have an amazing packing method to get your parts to you safely, and the quality of their kits is excellent. I recommend Electric Rider to those who are looking for a powerful ebike kit. Hill Topper (www.electric-bike-kit.com) – The Hill Topper kit by Clean Republic is what you want if you’re looking for an affordable way to get into electric biking. Their kits are some of the most affordable options around. The downside is that they aren’t the most powerful kits out there. But that’s ok, because what they lack in raw power they easily make up for in price and ease of install/use. The different power levels they offer are adequate for most people, and it’s hard to beat their prices. I’d recommend going for a larger battery upgrade if you can swing it, as you’ll always wish you could get just a few more miles. The Hill Topper kit is also one of the easiest to install, making it one of the best kits for absolute beginners and those that don’t feel as confident with their ‘tech’ skills. A few basic tools and 20 minutes is all you need to install this kit on your bike. EM3EV (EM3EV.com) – EM3EV has great quality mac motors, which are geared motors of a higher power level than most other geared motors. Their kits are excellent quality, but where they really shine are their batteries. These don’t come cheap, but you definitely get what you pay for. They use the highest quality cells and also build triangle shaped battery packs that fit perfectly in the front section of your bicycle frame. Shipping is from China, but the great customer service makes you feel like they are located in your own state. Also their shipping is very fair, especially compared to other Chinese companies that gouge on shipping costs. If you’re looking for a powerful geared motor or great quality batteries, check out EM3EV.com. Falco E-motors (www.falcoemotors.com) – Falco is doing something innovative in the ebike industry with their 5-phase motors and great quality batteries. Falco is a little less well known on the retail sign but they come from a long line of great ebikes and ebike parts and have a proven track record of great quality and matching service. If you’re looking for a unique, worry free system that will work well for many years than you can’t skip Falco. Ping Batteries (www.PingBattery.com) – Ping makes great lithium iron phosphate (LiFePO4) batteries that have been proven to last many years. My first Ping battery was install on a bike with a motor that was over twice the rated power. Even at that abuse my battery was still going strong two years later when I sold the bike. Ping batteries are rated at 2,000 cycles and are worth every penny. Ebay kits – Ebay kits can be hit or miss, and I’m including this here partially as a recommendation and partly as a warning. I’ve gotten some great deals by finding ebay kits, and I’ve also seem some garbage too. Some sellers are known to be reputable. For example, the seller Sun-Thing28 is known to sell good, reasonably priced batteries and the seller xcceries is a well known provider of good quality direct drive kits. The important thing is to search around and look at many options before buying. Do your research to make sure you find a kit that is best suited for you. Some companies overcharge for parts that you can find cheaper elsewhere. I haven’t listed those companies. Any companies I’ve listed above are well worth their prices and have the customer support that you’d expect when you’re making an investment like this. There are some great options out there and I’m sure everyone can find an ebike kit perfect for their own needs.